For those expecting the change to invigorate Pujols and for him to come bursting out of the gate, it was an agonizingly slow start for Pujols when the 2012 season started. 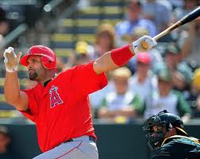 The pressure to perform among Angels fans was high, and rested heavily on Pujols’ shoulders. At the same time, he was still being vilified by some back in St. Louis for leaving just because of money. Whether or not that really weighed on his mind and affected his bat, is unclear, as Pujols is notoriously private, but things certainly started slow for him. His past years of performance had made those expectations high. Pujols has 475 home runs and it seems inevitable that he will eventually join the 500-home run club. He has an overall batting average of .325. He also has 2,227 hits and 497 doubles. He has 1,425 RBI and an on-base percentage of 1.025. Those are impressive numbers, but things were still very frustrating for Pujols when the season started. Perhaps it was just that expectations among the fans and players of the Los Angeles Angels of Anaheim and there was no way he was going to live up to those expectations. However, it seemed like everyone who was not a fan of the Angels was snickering and gloating as Pujols started the 2012 season and immediately began to struggle. So, for fans of Albert Pujols, the expectations are high once again. Whether or not those expectations will weigh heavily on him again, or if the way he ended the season will give him the momentum to make a big splash early in the season for 2013. However, signs are encouraging, and all signs look very positive for the slugger, and the team that he calls home.